If you have lost all of your teeth, unsecured, traditional dentures are a solution which in many cases has limited success. At times painful, inconvenient and unstable, such dentures can make chewing foods difficult, which could stop you from eating many of the foods you once enjoyed. Wearing dentures may also affect how you pronounce words, and therefore the way you speak. This is because missing teeth can actually cause bone loss because the bone is no longer stimulated when you chew food- something that happens routinely when you use your natural teeth. Significant bone loss can actually shrink the contours of the jawbone, causing wrinkled lips and a sunken mouth and chin and causing dentures to lose their fit. They often slip, cause pain, or even become embarrassing. However, modern dentistry has solutions to suit a variety of needs and reduce the side effects of wearing dentures by tooth replacement with implants- effectively stimulating the bone like natural teeth would. The All-on-4 procedure is one such solution. The All-on-4 treatment concept replaces your missing teeth with a full dental bridge supported by only four dental implants. With less implants needed, overall treatment time is reduced. 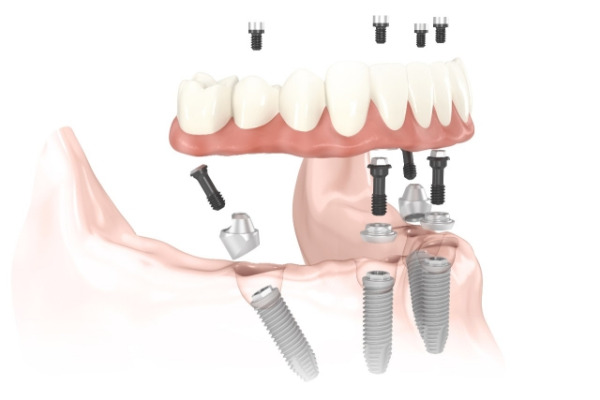 The unique All-on-4 solution of tilting two of the implants also ensures a secure and stable anchorage for the replaced arch, reducing the need for bone graft surgery to increase bone volume. Your new replacement teeth only require four implants for each jaw. With fewer implants required, the cost is lowered. Typically, your replacement arch can be attached to your implants immediately after insertion. There is no need to wait for healing time between surgery and tooth replacement. These provisional teeth look and feel much like natural teeth, and you can lead a normal life immediately after surgery. After a few months of healing time, your dentist will place your final bridge. Your quality of life is improved, and you can start enjoying your favorite foods again.